Wanna play a little game of “I Spy”? 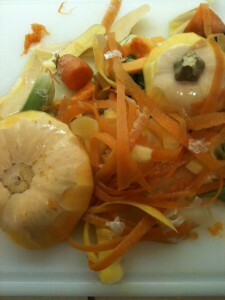 Food scraps for the wigglers! Today I made a huge pot of soup. I am not going to tell you what type…not just yet! First, I’d like you to play a game with me. Please, please, please play along with me! Are you ready? Too bad I won’t be able to hear your guesses. Oh well! O.K. so here goes. I am sure in your life you’ve played “I Spy”, right? Well, if not, I’ll give you quick “how to”. You can play this game with an unlimited number of players. You need at least one person to play with besides yourself. Basically, it’s a guessing game. You look at an object, maybe an apple that’s on the counter. You would say, “I spy something red” and the person tries to guess what you are looking at. Not too difficult, right? Let’s play! Be prepared to be challenged! I spy something orange and stringy….. I spy something yellowish, orangish…..
All done……Here are the things I was looking at. Butternut Squash Soup! These scraps are now in the worm bin being devoured by the Red Wigglers!